Is there a negotiable issue in dispute? Will all parties voluntarily commit to a face-to-face meeting to try to agree? Can any party get away with simply ignoring the problem? Mediation is attractive if the parties want a private solution. Mediation is attractive if the parties want a flexible and informal process or if other options for resolving the conflict are not desirable. Mediation is often recommended where both parties have an interest in maintaining their relationship, this can be particularly important in divorce/separation cases where there are children involved and the parties will inevitably remain a part of each other’s life after the dispute is resolved. It is helpful, but not necessary, for the parties to trust each other. Trust makes mediation easier, but it is not a prerequisite. Disputes about tangible issues (such as money, property, behavior, rights, licenses) tend to be easier to mediate than disputes based on personal values or beliefs. It helps if the power balance between the parties is fairly equal. It is essential that one party not be able to dominate another or unilaterally dictate the outcome of mediation. At the same time, keep in mind that mediators are trained to assess power imbalances and can often intervene to balance inequities. The presence of legal counsel or use of independent legal advisors is one way to establish bargaining equality. It helps if each party needs something from the other. This way there is more likely to be an equality of bargaining power and an incentive for each party to reach an agreement. Mediation often works well for complex cases requiring creative solutions. As a general rule, the earlier a dispute goes to mediation, the more likely it will settle. The longer a dispute goes on, the more parties tend to become committed to their positions and less willing to consider another point of view. there is fear of violence between the parties and the mediation would not be safe. 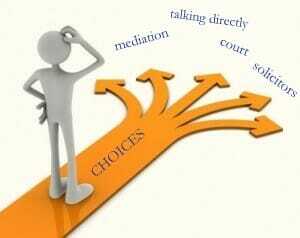 Divorce/separation cases which were characterized by domestic violence would not be appropriate for mediation. As the mediation proceeds, the mediator will assess the viability of the process and will end the mediation if he or she concludes that it is unfair or prejudicial to any party, or unlikely to resolve within a reasonable time. We encourage our clients to attend mediation before they come and see us. Ideally, by talking, parties will save considerable cost. We believe that a line of communication open between the parties makes the whole process go smoothly and results in a better and more robust agreement.